Over the last few days i’ve visited our local Asian supermarket a fair few times. God knows why it had been so long since i’d been- everything there blows my mind. So many new, interesting, incomprehensible (sadly i don’t speak Mandarin) goods on offer. I went in search of good quality tofu and rice wrappers. Hidden away at the back of the shop was more tofu than you could shake a very beautiful bamboo stick at. Sadly i didn’t find rice wrappers though i did end up with some pretty funky Bean Curd alternatives. I guess it started with the midnight Ramen and since then i’ve developed a serious craving for all things marinated in sesame oil, rice wine vinegar, ginger etc, etc. In my hunt for some really firm tofu i managed to pick up some Soba noodles and Nori wrapper and can’t i just feel Sushi coming on. 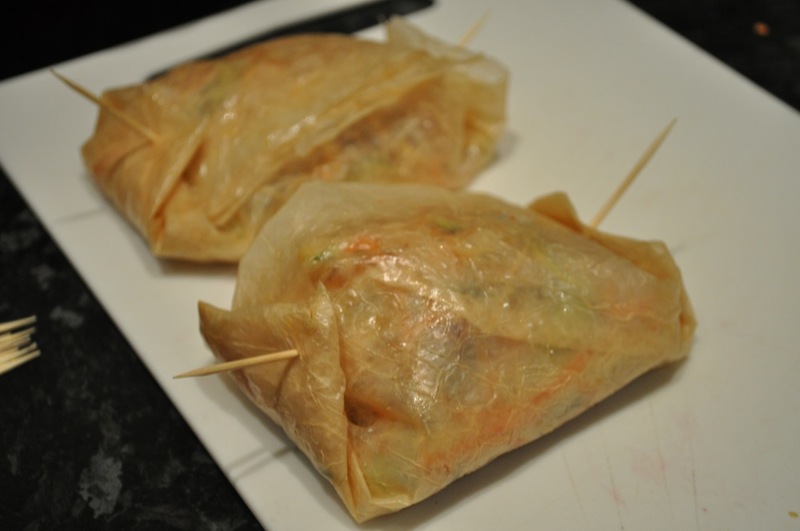 But last night i decided to start with a baby step- steamed Bean Curd Parcels. I don’t own a steamer of any sort but made do with a sieve placed over a very shallow pan of boiling water and the results were just fine. 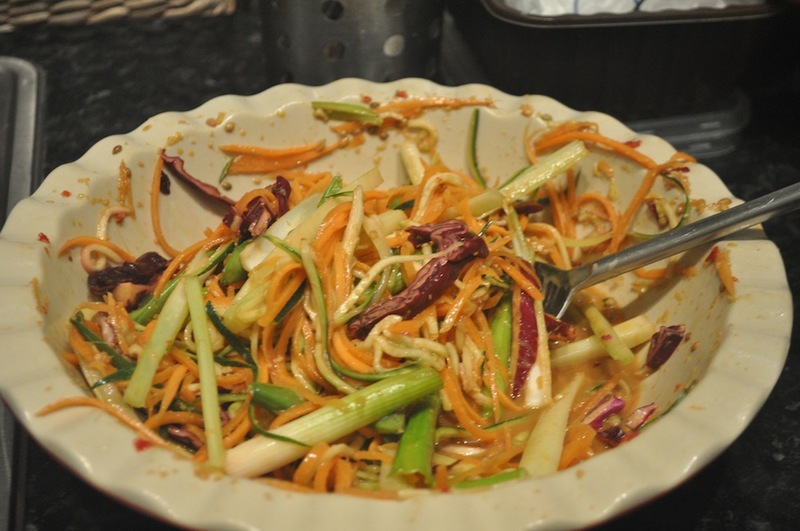 I wanted the filling of the parcels to be as barely cooked as possible so i cut all my veg into matchsticks and marinated them in a whole heap of good stuff. To accompany both the parcels and the grainy, dark noodles i opted for an earthy, sweet marinated tofu. 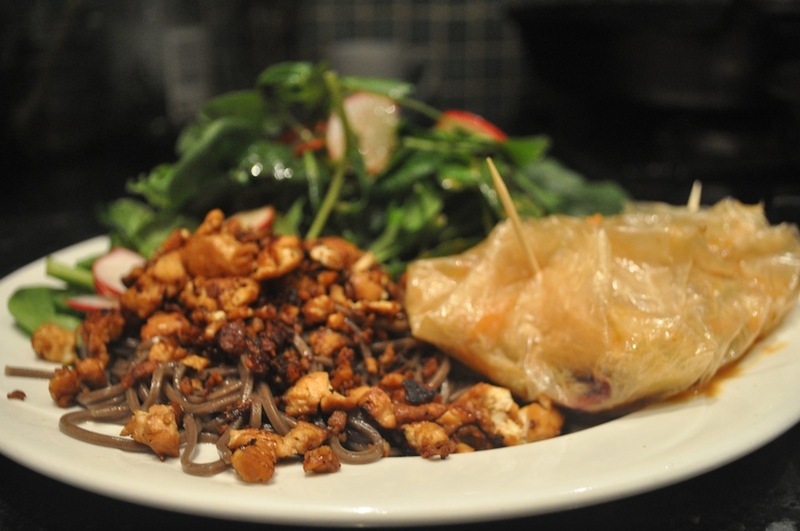 I served the tofu over Soba noodles which i drizzled in (more!) Sesame Oil and the parcels on the side with a simple radish/ leaf salad.